Let us begin with a quibble. 'Ultimate' means 'final', 'the end of a process', 'the best achievable of its kind'. If this title were correct, then a second edition of the book would hardly be necessary, let alone a third. So either the title is wrong, or the author is misusing the word 'ultimate' as 'advertising-speak' to mean 'very good'. The book is in fact good, but with that title, it is off to an unimpressive start. It does not help that on the cover the word 'Ultimate' is in bright yellow on a teal-coloured background, making the book look like a cheap advertising poster. The pages add to the 'cheap' impression being apparently made of recycled material, being yellowish and thin. The book itself is 414 pages, divided into 50 chapters, an answers section and an index. The text is well-spaced and there are no empty 'white spaces'. There are no illustrations. Each section starts with an explanation of the type of phrasal verbs which will be covered, and how these are used. Depending on the complexity of the topic, these explanations can be one or two paragraphs or one or two pages long. So we have discussions on - for examples - transitive and intransitive phrasal verbs, separable phrasal verbs (with a noun/pronoun between the verb and preposition e.g. 'tell him off') and the use of phrasal verbs as adjectives, gerunds and so on. A considerable portion of the book is taken up by exercises for the student to complete. The exercises are usually four or five sets of sixteen sentences where students have to fill in the right phrasal verb. So who is this book for? Well, the target reader is specified on the cover. 'For ESL and EFL students'. 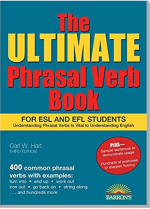 English-speaking students who are unsure how to use phrasal verbs can also benefit from the book, though most will probably not want to spend that amount of money on a book which deals with just one part of the language - even though it deals with it very thoroughly. This book would also work well in a classroom where a teacher can distribute the book for specific exercises. However, this again shows why it is often a good idea to put the exercises into a separate workbook so that the part which explains the grammar can be re-used. Verdict: Verdict – Everything - and more - that you want to know about phrasal verbs.